Unsurprisingly, given Allan’s interests, a few algae crept into our lichen course too. Of course, when you are talking about lichens, algae are never that far away, albeit hidden in a mass of fungal hyphae. However, in a few cases, we saw free-living algae growing alongside lichens. One of those examples had a bright orange hue that resembled a fake tan. To the untrained eye this could be mistaken for a lichen; however, when you peer at it closely through a hand-lens, you see that it is composed of a mass of short filaments. It is, in fact, a terrestrial alga called Trentepohlia aurea. If you’ve followed my blog you’ll know that colour is not a good indication of the group to which an alga belongs. This bright orange organism actually belongs to the “green algae”. Most of these are, indeed, bright green in colour, but we’ve already met Haematococcus pluvialis which was bright red (see “An encounter with a green alga that is red”). You may also recall that Haematococcus was also an organism of limestone environments where, once again, they were not permanently submerged. When exposed, they are exposed to the full glare of the sun so, just like a sensible human, they cover themselves with sunscreen to keep the harmful UV light at bay. Trentepohlia aurea just has a slightly different type of sunscreen to Haematococcus. Quite why any alga wants to cover itself in sunscreen in a shady forest on a dank Saturday in April escapes me, but that’s evolution for you. Trentepohlia aurea in the grounds of Malham Tarn field centre, April 2014. a. a metre-high patch on a vertical limestone face; b. the view through a hand-lens; c. filaments of Trentepohlia aurea photographed under the microscope. Scale bar: 10 micrometres (1/100th ofa millimetre). Under the microscope, Trentepohlia resolves into a mass of tangled filaments, some branched, and each with a single chloroplast which contain both the green chlorophyll pigment plus the carotenoids which give the alga its distinct colour. The tangle of filaments that I can see is, however, not the whole story. When Trentepohlia is grown in the laboratory, it is possible to see two types of filaments: a network of heavily-branched horizontal to the substrate from which a series of erect filaments arise. These are the ones that give the tufts of Trentepohlia their bushy appearance when viewed with a hand-lens. Once you get your eye in, you can see Trentepohlia in many places. Because some species like limestone, they are also found on many man-made surfaces, including concrete, which has encouraged it to follow humans into cities. Of course, not everyone appreciates the microscopic beauty of algae: Fabio Rindi and Mike Guiry (see reference below) noted a general decline in Trentepohlia in Galway, in the west of Ireland, in recent years. They attributed this to the boom in the Irish economy (they were writing in 2002) which meant that people were able to take better care of the exterior of their houses. They also noted a preference for public over private buildings such as old walls and parapets of bridges. The first alga with a distinctly socialist niche, perhaps? Rindi, F. & Guiry, M.F. (2002). 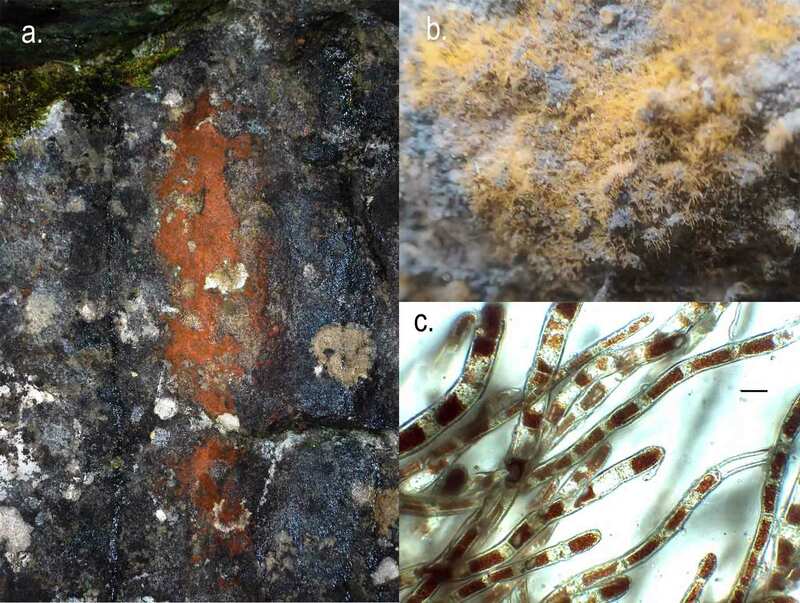 Diversity, life history and ecology of Trentepohlia and Printzina (Trentepohliales, Chlorophyta) in urban habitats in western Ireland. Journal of Phycology 38:39-54. This entry was posted in Uncategorized and tagged algae, Galway, Malham Tarn, socialism, Trentepohlia. Bookmark the permalink.